Who once has seen an AXI playhouse, they will recognize it immediately. Of course, made of wood, immediately taken the playful shapes on. As if they were straight out of a signed fairy tale. High quality and so they will last for years. And that may also be in terms of size because a AXI Playhouse is for children from 3 to 12 years. The bright colors and fun details of AXI playhouse is always a real jewel for the garden. And of course, children can play actively with AXI playhouse. Difficult to assemble? No, it is not so bad. We have an AXI video where they show how to build an AXI playhouse. Our page has information that we usually deliver the goods with DHL, UPS or TNT shipping method. These carriers have weight restrictions so they are not really suitable as a carrier for example, for a Playhouse AXI. That's why we have specialized carriers available. Because of dimensions we do not stock the wooden playhouses. But we have made excellent arrangements with the suppliers, so we usually deliver within 24 hours. You can buy an AXI playhouse at Per Sempre Toys! 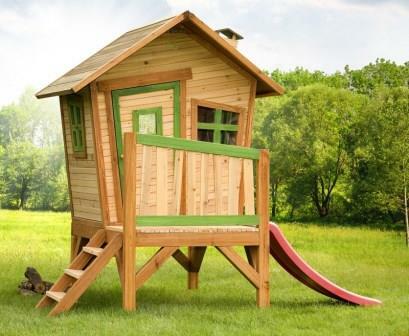 Click here to go to the page with a wooden AXI playhouse..